"It is possible to transform in marriage if we don't harbor the expectation to reform our partners." Alright guys, here's the deal. I fell asleep last night with absolutely no intention of waking up for this wedding business. But wouldn't you know that I fell asleep with the TV on and was awaken RIGHT SMACK DAB IN TIME TO WATCH THE WEDDING COMMENCE. It's currently 3:37 a.m. pacific time and I'm listening to this Bishop give this speech. So, what would a post be without my thoughts? Kate looks stunning. This isn't a surprise. But this lot in life was not meant for anyone else except for Kate. I mean she truly looks like a princess. Pippa is pretty friggen hot too! I love the bright coats that William and his men are wearing, mostly because I thought there were going to be the drab navy his father sported back in the day. But I like that they kept things modern. PS: totally knew Kate would go for long sleeves. My mother told me a few months back when I got married that she was thinking a long sleeved something would do, and I looked at her half crazy. But now that both Kate and Nicole Richie have done it, I feel like that's God's blessing. Right? Everyone is SO COMPOSED. I don't see a tear anywhere. I'd be losing it. Then again, I haven't dated William for 10 years, and I'm not looking at it as marrying the love of my life -- I'm looking in as an outsider and getting caught up in the whole royal/princess/bigger than life ordeal. They're all so serious and not very affectionate (yet?). This wedding has to be a logistics nightmare. God bless whoever orchestrated and executed this production. The orchestra, the choirs singing. It's remarkable. I am watching this and they're showing all the fans and supporters outside waving their flags and singing the hymns. I feel like it's a movie or something, where everyone around the world is singing along at the same time. I like that Will and Kate are keeping it real. They're young and they're walking down this aisle chatting and smiling. Will looks like he's won the jackpot. His mother would be so proud! 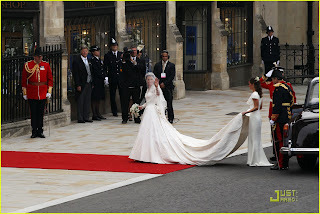 I mean, every girl spends their wedding day wanting to feel like a Princess, and Kate looks like one AND is becoming one. Pretty cool. I want to give credit where it's due: Kate is 29. She is a woman. I am so happy to see that both she and Prince William are older because I feel like with their experience and maturity at hand, they'll prosper in marriage. Not that you can't get married young and prosper, but I think having more life experience helps. Will & Kate know each other inside and out, having known each other nine years before this big day. Will to Kate: "You look beautiful." Listen, I was the last one to get jacked about this wedding. "So what? It's just a wedding." But when I go to weddings, I am constantly reminded of how beautiful it is that God created a covenant for and between two people that love each other. That we can marry a person and dedicate our lives to cultivating, protecting and enjoying a single relationship. I know it sounds sappy and ridiculous, but it's really a beautiful blessing to be given when the time in right. In other words: yes, I get the hype now. This royal wedding is meaningful because now I know how my Mother felt about Princess Diana, someone whom I never really connected with, but knew was a soul loved by so many of our mothers. I didn't really get why. I didn't buy into the fairy tale aspect of it all and thought it was stupid that people do. However, it's not the fairy tale so much that Kate is marrying and becoming a princess, but that's a life most everyone I know, including myself, will never have. I won't get married at Westminster Abbey. It's doubtful that I'll fall in love with a literal Prince or have Sir Elton John at my wedding. That Jay-Z and Beyonce will perform at my reception. Or that millions of people around the world will care to watch my wedding. It's something so idyllic that it's hard not to fall into the hype. 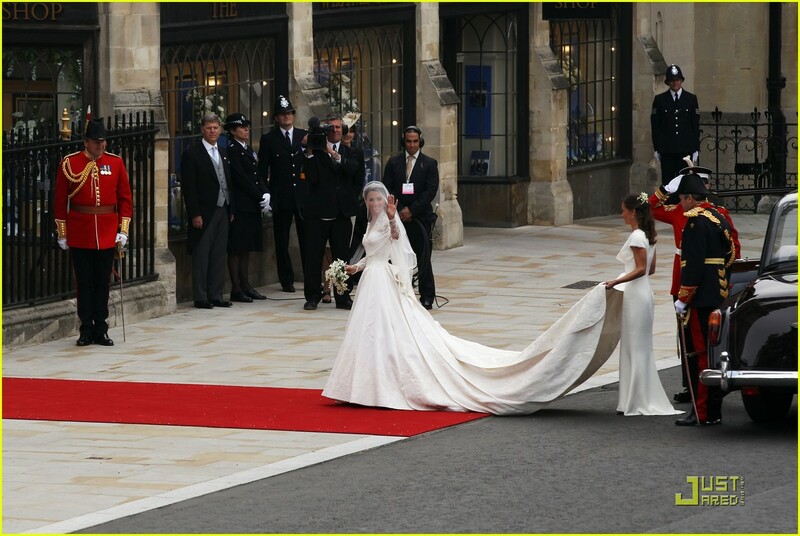 And watching has made me not only interested, but is showing me that a royal wedding is historic and not something to overlook. It also is a huge compliment that the British are so thrilled to have her. Millions of people watching and a country who is practically chomping at the bit to get a glimpse of the new royal in town? What a fabulous welcoming. Kate is already so popular in our culture because she's this beautiful thing with a great sense of style. She's an icon, really. I believe this is how our mothers felt about Diana, so now I understand where the worship comes from. She is someone to look up to. Like some girls might love Erin Andrews or Carrie Underwood (I wonder where I pulled those names from? ), Kate is someone who can inspire. I think that everyone discredits this whole ordeal because women are afraid to admit they'd like to be a Princess. I wouldn't want the structure and the soon-to-be politics that follow (or really any of the royal 'stuff'... I'm not tame enough I don't believe), but having the title of Princess before my name? Awesome. However this life is not in the stars for me -- can you imagine? "Princess Kirbie"? Yeah, not a great ring to it. Doesn't sound very regal. It must be a surreal day for Kate and I love seeing two people so happy! I am sacrificing my sleep but I am glad I am witnessing this beautiful moment in history. Except I'd be really thrilled to get invited to Prince Harry's after party! You know that's going to be a riot.